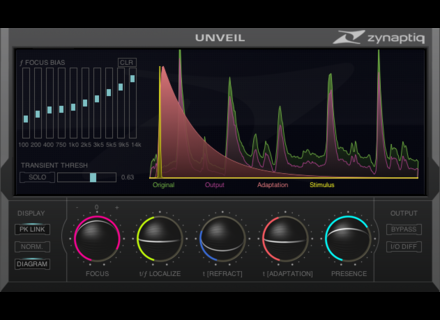 Zynaptiq announces the availability of version 1.5 to Unveil, their de-reverberation and signal focusing plug-in. This free update adds VST, RTAS and AAX Native support for both MacOS X and Windows systems, as well as several workflow enhancements, and is available now. 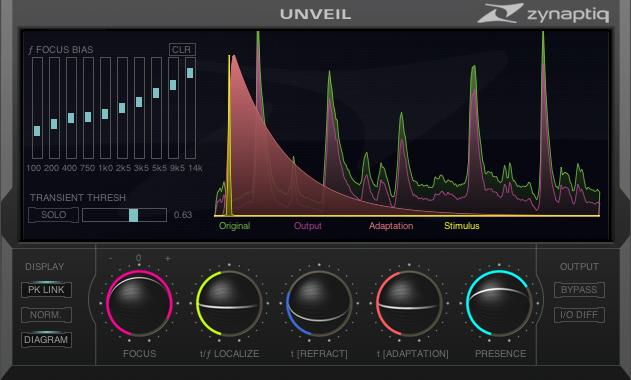 Unveil is a real-time, de-mixing based plug-in that allows attenuating or boosting reverb components within a mixed signal of any channel count, including mono sources. 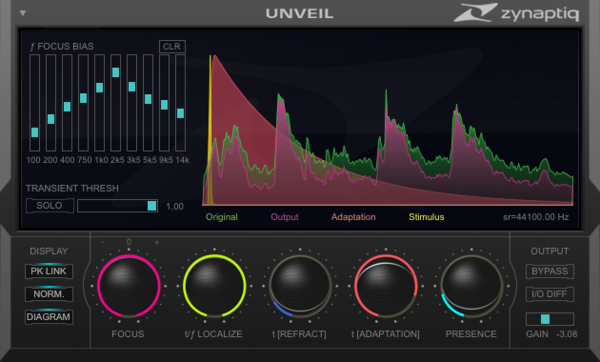 Additionally, Unveil is designed to allow bringing the key features of a recording into focus, or moving them to the background, by attenuating or boosting less important signal components. Now supports AudioUnits (32/64bit), RTAS, AAX Native and VST 2.4 (32/64bit) on MacOS X, and RTAS, AAX Native and VST 2.4 (32bit) on Windows. Support for AudioSuite in ProTools 10 via the AAX Native plug-in. New preset management functionality accessible from within the plug-in GUI designed to allow user presets to be used across all plug-in formats on all platforms. New multi-mono capability in Logic Pro 9.x to allow for individual settings for channels in multi-channel/surround scenarios (note: multi-mono also supported for RTAS & AAX Native). New option to enter values numerically by double-clicking controls. Windows VST 2.4 64bit support is being worked on and will be part of a free v1.5.x update. Check out Zynaptiq for more details. Apogee Quartet Available Apogee Electronics announces that Quartet, a desktop audio interface and control center for Mac, is now shipping. NI Re-Releases Plug-ins with Half-Price Special Native Instruments announced the re-release of four studio effects. Imperial Grand Convertible Version 2.7 Sound Magic has updated Imperial Grand Convertible Version to v2.7.